Summary: How did Aquaman ask out Mera on their first date? Why did Superman go surfing? What happened when Batman was late to play baseball with Robin? There was a Wayne delay. What is Cyborg’s favorite cookie? When THE OFFICIAL DC SUPER HERO JOKE BOOK by Noah Smith, Sarah Parvis, and Michael Robin was first brought to my attention, I knew I had to see it! My son (and his dad and his uncle!) love DC superheroes, and I thought these "punny" jokes would be perfect. I swear my husband and his brother are super heroes themselves when it comes to "dad jokes." THE OFFICIAL DC SUPER HERO JOKE BOOK is actually better than I even expected. It's aimed at ages eight and up (although I do know a few adults that will love this book! ), and it has more than 600 jokes. And by jokes, I mean all types of jokes -- puns, knock-knocks, one-liners, riddles, tongue twisters, and more. It really is pretty funny and certain to bring a smile to your face! 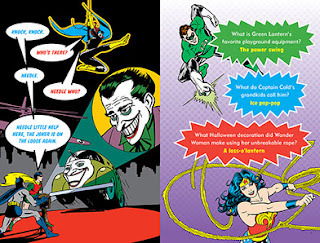 In addition to the jokes, there are terrific full-color illustrations of the DC super heroes. In fact, the entire book has the look and feel of the comics with the textured backgrounds and speech bubbles. Each two page spread has a few jokes, so I'm pretty sure that your kids can keep you entertained with a few jokes a day for months! I can't wait to share this book with my son. I have a feeling that he's going to love these jokes, especially the puns. 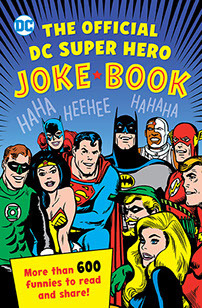 THE OFFICIAL DC SUPER HERO JOKE BOOK is a must-have for DC Comics fans -- kids and adults alike! That looks wonderful! Carl's parents gave Vance a joke book when he was young and we heard those jokes for months! I'm sure he would have loved this book. Great idea! I think my 8-year old grandson would probably like it.